The unusual period of freezing weather in New Orleans has put so much strain on the New Orleans water system that residents need to refrain from using water when it all possible until the emergency boil water notice can be lifted, though the electrical system is expected to be able to handle the load, Mayor Mitch Landrieu and other officials said late Thursday morning. In part because of residents running faucets to keep pipes from freezing, and in part because of frozen pipes bursting in the cold, the water systems in Orleans and Jefferson parishes had so much demand overnight that the water pressure fell to unreliable levels, creating the possibility that contaminated water could enter the system and requiring a boil water notice. Officials will not be able to begin testing the water quality until the system can generate enough water to refill the pipes, so they are now urging residents to conserve as much water as possible. “Everyone can now see that this prolonged freezing is stressing the critical water and power utilities in New Orleans and all surrounding parishes, notwithstanding the fact that the sun is out,” Landrieu said. Activities to avoid include running dishwashers or laundry machines, and perhaps taking baths, Landrieu said. Officials do not have an estimate on how long it will take to restore capacity to the system, he said. As pipes begin to thaw, it is particularly important that property owners check sprinklers and irrigation systems for leaks, said Marcie Edwards, interim director of the Sewerage & Water Board. Wasted water will delay the utility’s ability to lift the boil-water notice, she said. “It’s not going to have a 24-hour turnaround,” Edwards said. Jefferson Parish is experiencing similar issues, resulting in the first boil-water notice there since Hurricane Katrina in 2005, Parish President Mike Yenni said. No boil-water notice has been issued on the Westbank in either Orleans or Jefferson parish. Where the Sewerage & Water Board can identify major leaks on private property, workers are trying to let property owners know to begin the repair process as quickly as possible, officials said. In some cases, the Sewerage & Water Board may be shutting off the water involuntarily to those properties. Officials with Entergy had asked residents to limit their electricity usage as well, but CEO Charles Rice said Thursday morning that the request has since been lifted. 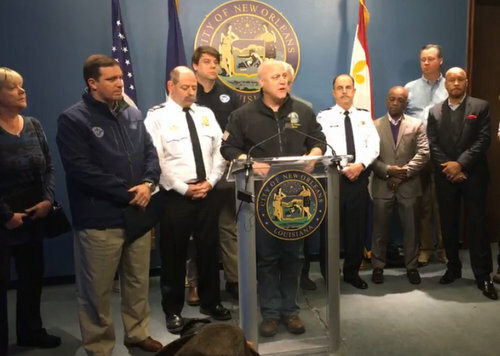 Among the 1,000 calls for service, first responders have handled nearly 100 crashes as a result of icy roads, Landrieu said. Officials are also asking residents to avoid driving, but the interstate through Jefferson Parish is expected to reopen today, Yenni said.